I’m not a big connoisseur of Russian music. My knowledge of it barely extends past ???????. And that’s because they constantly ran that damn ???? ???? video on MTV when I was in Russia. That said, the Moscow Times features a must have album in their Context section: Gulag Tunes: Melodies and Rhymes from the Gulag. Gulag Tunes combines Russian prison songs (??????? ?????) with surf music. I’ve been a fan of surf music since I had my Man or Astroman phase about ten years ago. 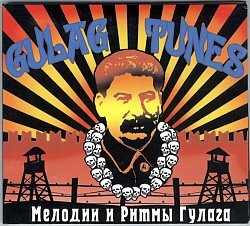 The cover of Gulag Tunes, featured to the right, is worth its weight in gold. It pictures Stalin with a Hawaiian necklace of skulls, hovering over a silhouette of a prison camp. Drinking red wine in an outdoor cafe, Antipov told the story of the album’s creation while seated next to his wife, Yelena, who translated the song titles into English and lived alongside the recording process in the couple’s home studio. Antipov recalled how he recorded a couple of songs in the surf-music style and played them to rock critic Artyom Troitsky, who became the album’s producer. “Troitsky said that it was a great idea, and that I should develop it; that it would be possible to make a whole album, and maybe even more than one, because the topic is very rich, and there is a lot of material,” he said. “No one has ever done this before, although the idea is lying on the surface. It’s an obvious thing,” he commented. The album doesn’t have vocals. “If you know the words, you can sing along,” Antipov said. He made the album with guitarist Maxim Temnov, who is an expert on musical arrangements of blatniye pesni, and has also performed with the band Leningrad. “Many of the authors really did write the songs while they were in the camps,” Antipov said, although he added that determining precise authorship can be tricky. The songs often have eight to 10 different versions. Some were performed by officially approved Soviet artists such as singer Leonid Utyosov, but the lyrics were often changed. “The album brought some people to tears,” Yelena Antipova said. After an initial printing of 1,000 copies, 300 were sold during the first week alone in Soyuz stores, despite a lack of promotion from the company. Apparently a second album is in the works. You can get more information and listen to a few of the Gulag Tunes at the album’s MySpace page. PrevPreviousChechnya & Iraq: Comparable Conflicts?